// Probability of success (as a fraction). 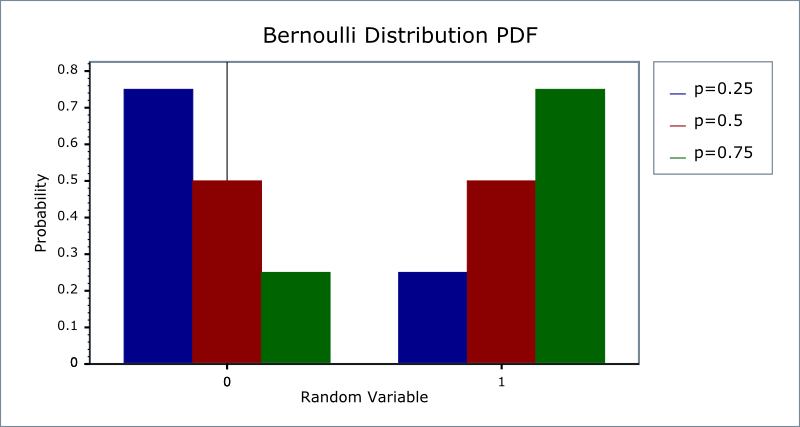 The Bernoulli distribution is a discrete distribution of the outcome of a single trial with only two results, 0 (failure) or 1 (success), with a probability of success p.
The Bernoulli distribution is the simplest building block on which other discrete distributions of sequences of independent Bernoulli trials can be based. The Bernoulli is the binomial distribution (k = 1, p) with only one trial. probability density function pdf f(0) = 1 - p, f(1) = p. Cumulative distribution function D(k) = if (k == 0) 1 - p else 1. Constructs a bernoulli distribution with success_fraction p.
Returns the success_fraction parameter of this distribution. The domain of the random variable is 0 and 1, and the useful supported range is only 0 or 1. Outside this range, functions are undefined, or may throw domain_error exception and make an error message available. The Bernoulli distribution is implemented with simple arithmetic operators and so should have errors within an epsilon or two. In the following table p is the probability of success and q = 1-p. k is the random variate, either 0 or 1. 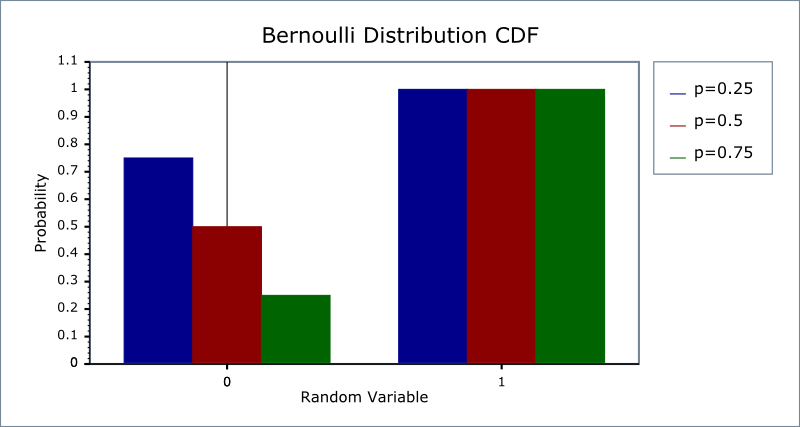 Eric W. "Bernoulli Distribution." From MathWorld--A Wolfram Web Resource.